It's El Greco's Christ Carrying the Cross and I think it's a really interesting painting. I love the simplicity of it: just big swathes of dark color, everything very simple, with the extremely detailed face (if you find a bigger copy of it somewhere on the internet, this is more obvious): it's clear where the focus is supposed to be. 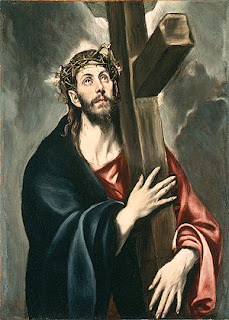 And how calm everything looks, with the really dark sedate colors, the super unemotional look on Jesus' face, even his grip on the cross: he doesn't have one. He's not carrying it over his shoulder so much as he's embracing it. Embracing the instrument of his own execution. Just stone calm, unafraid, looking up to heaven, embracing freaking death.